Why must a firewall be used? Do other colleges in our region use a firewall like ours? More and more colleges and organizations are recognizing the need to hire specialists in cyber security to address the growing threat of cyber crime. What does the firewall do with information from the sources above? How long does it take for the Firewall to determine a wellness rating for a brand new website? Is the firewall the only thing that blocks access to a website? No, browsers such as Chrome, Firefox, and Safari block or put up warnings about websites they detect as being unsafe. Increasingly, websites with mixed content are being flagged as “unsecure”. *Mixed content is when a web page is loaded over a secure connection (HTTPS), but parts of the same page are loaded over non-secure (HTTP) connections. What should I do if a website I need to access is blocked even after 10 minutes? Call the Helpdesk at x4444. Our firewall administrators will determine if there is a malfunction or if the blockage is due to a real threat. I use the web in my classes. Will all the websites in Moodle classes be impacted? Since the database of infected sites is global most sites have already been given a “wellness” score in the database. Thus most of the websites in Moodle-based classes will probably not experience any delays. However, if you build/use a brand new website, since it has not been scanned and categorized as “safe” or “malware-free” you may experience a delay. If you don’t have any brand new websites that have not yet been accessed, delay probability is low. If you do experience delays that last more than 10 minutes, please call the helpdesk at x4444, because something else might be going on that we need to investigate. What about classes where the students are expected to do research on the web? Most of the student searches will yield sites that are already in the global database which means there will be no delay. We expect there will be little impact on your class. Aren't standard virus/malware protections up to the task if no one is entering personal information? Is there some way to turn this off for specific computers? If a phishing email is clicked on, or a website with a payload is visited, virus and anti-malware protection may not stop it. In addition, turning off the protection means we are compromising the school’s infrastructure. For instance, if firewall rules were turned off, denial of service attacks or other malicious attacks could be launched from our campus network by a third party from anywhere on the globe. The computers in my classroom already have Deep Freeze. Can’t classrooms be turned off from the firewall rules? Deep Freeze will protect the computer images in labs from most threats, but until a reboot takes place, these computers can harbor malware. Attacks can be launched and other machines can be compromised. A single compromised computer can spread lots of havoc on the network and beyond even while frozen. If I build a brand new Moodle Class will there be delays? No, but if you put URL links in the class to websites that are brand new (i.e. just built) those links might need to be scanned by the firewall. For instance, suppose you decided to create a website that hosts animated 3-D models for chemical structures called MyOwnChemicalStructures.com. You built the website over the summer and just brought it online in the fall. The first time someone tried to view it would result in the site being scanned. Once scanned, as long as the host server is clean of malware, there would be no delays. 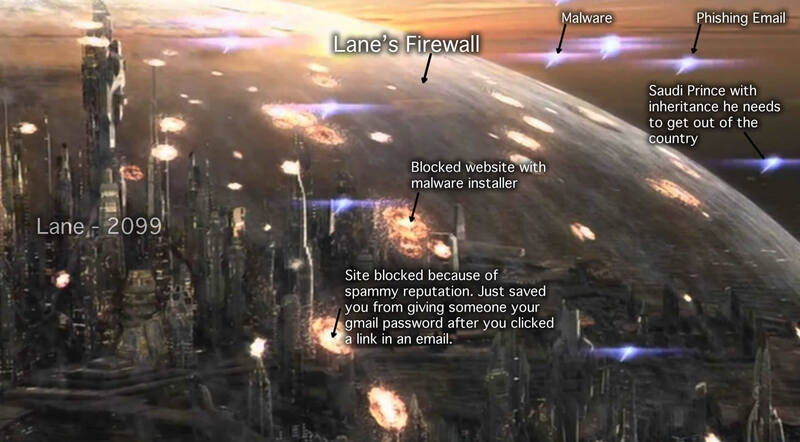 Have we had any attempted attacks on our servers or network at Lane? We have hundreds of attacks every single day. Where do these attacks come from? Is information security important for higher education? After all we aren’t a for profit business. The Educause Center for Analysis and Research (ECAR) is a research group whose work is targeted specifically to IT professionals and higher education leaders. It is the only subscriber-driven research organization dedicated to understanding IT’s role in colleges and universities. They publish a top ten issues list for IT leaders in higher education each year. For the past three years Information Security has been ranked number one on their list. Here is ½ hour presentation from the University Business Executive Symposium held in Dallas, Texas on October 3-5, 2018 targeted at Presidents, Provosts and Higher Education Leaders concerning Cyber Security. What is a “Drive by download attack”? Be the first to know when more helpful information is posted to this blog! Your email will only ever be used for announcements from the IT Blog.